A reception menu made up of cheap wedding food can free up money to spend on other aspects of your wedding and leave your guests none the wiser about your budget-saving efforts. With the variety of wedding reception food ideas on a budget, you can easily create a low-cost menu that will satisfy and please every stomach. Offering a limited bar is a great way to cut down on costs. Soft drinks, water, beer, and wine are usually the most inexpensive options to offer at a bar while pleasing most people. Picking up a variety of these drinks before the wedding on sale is a great way to cut costs. Select less expensive cheeses for the station. Many big box stores sell large quantities of frozen vegetable quiches that you only need to warm up before serving. Salad greens of varying type can be purchased in bulk. Using cherry tomatoes that you cut in half allows you to buy only a small amount of tomatoes and spread them throughout your salads. Balsamic vinaigrette can be easily made in bulk using the easy-to-find and inexpensive ingredients of balsamic vinegar, olive oil, salt, and pepper. Chicken breasts are sold in bulk at many big box stores. You can purchase several packages and prepare them all the same way, pouring a pre-made sauce over or sautéing them with a sauce of your choice. Carrots are an inexpensive vegetable, allowing you to serve several to each guest at a low cost. You can stretch a few potatoes by adding milk and butter when mashing them and have them serve more guests than if you served each an individual baked potato. Keep the chicken and mashed potatoes warm in slow cookers for serving. A few boxes of cake mix and homemade or store-bought icing allows you to create quick and easy DIY cupcakes that are perfect for any wedding celebration. Caterers usually have a list of signature drinks and a non-alcoholic punch that they can create. For these options, steer clear of drinks that require fresh fruits, juice or other ingredients, as these tend to be more expensive. Also, ensure that your caterer will use the least expensive brand of alcohol available for the signature drink. 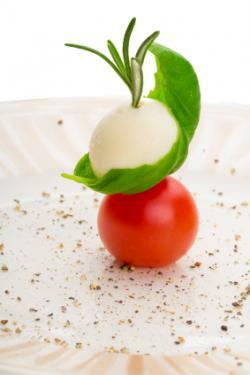 Small-sized mozzarella balls on toothpicks with basil and a half of a cherry tomato allow guests to obtain an individual serving without breaking the bank. Crostini only requires slices of a toasted baguette, as well as tomato sauce and a few thin slices of red onion. A big way to cut costs is to forgo a separate salad course and add a salad to your main dish. Tilapia is usually a very inexpensive fish that can be grilled or baked and then topped with thin slices of sautéed red onion. White rice is inexpensive and can stretch to feed multiple people, and is easy for any caterer to prepare with little labor costs passed down to you. The side salad can consist of a few greens with a cucumber slice or carrot slivers with a vinaigrette. Most caterers are able to create a basic wedding cake that does not have a filling or extensive decorations for little cost. To cut costs, ask your caterer if they can provide a small cake for you to cut and serve to just you and your new spouse and have sheet cakes in the back that can be sliced and served to guests. You can cut costs even further by not having a cake for you to cut and just serving everyone a slice of sheet cake. Drinks: A glass of champagne for each guest for toasting eliminates the need to offer a fully stocked bar without forgoing alcohol altogether. Supplement with water and soda you purchase on sale. Appetizer: Set up a station with artichoke dip and vegetables. Dip is often inexpensive to make and can be made in large quantities without need a lot of cooking skills. Additionally, you can choose inexpensive vegetables to serve alongside the dip. Cake: By shopping around, you can usually find a bakery offering basic wedding cakes for little cost. In fact, the bakery department in many grocery stores offer wedding cakes. This option allows you to not spend much on a cake but also avoid having to make the cake yourself or paying a caterer to make the cake, which often costs more. 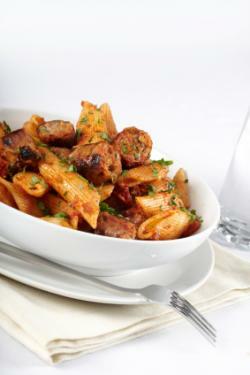 Main dish and sides: Pasta with sausage and a small Caesar side salad are easy for catering companies to whip up. These dishes require a little advance preparation but still use inexpensive ingredients, making it perfect for a caterer to provide. 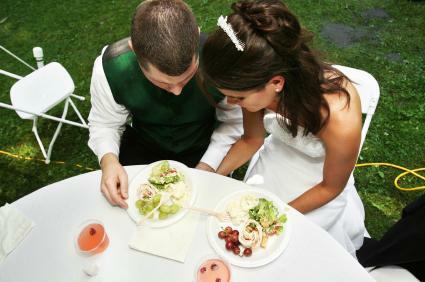 The menus above are samples, and there are many more low cost food suggestions to serve at a wedding. Alcoholic beverages can cause a reasonably priced wedding reception to skyrocket in cost. In most social circles, a cash bar is unacceptable, so consider purchasing cheap bulk wine or champagne and a keg for guests. If you want to save even more money, consider hosting an alcohol-free wedding reception and serve mocktails or punch instead. Purchase bags of mixed nuts, mints, and candies for guests to nibble on before dinner. Dinner rolls with butter are also a filling way to start guests off at the table without spending too much money. Look for finger foods, such as mini tacos and slider burgers, or filling selections that are budget friendly from the start. Tacos: Tacos are fairly inexpensive to make and generally well liked. This is because the cost of flour or corn tortillas is reasonably low and the meat and spices can be purchased in bulk. Consider offering a taco bar with all the fixings to allow guests to make their own tacos. Pasta: Pasta is one of the most popular choices for weddings mainly because of its low cost and ability to satisfy hearty appetites. Pasta is also easy to make in bulk, whether you want fettuccine alfredo or a version with marinara sauce. Hotdogs, hamburgers, and other grilled items: Almost everyone enjoys a fun barbecue. Add buns and sides of potato and macaroni salad and you're set. Casseroles: Casseroles, such as broccoli casserole and tuna casserole, are delicious feel-good meal options that your guests will enjoy without even realizing you were saving money. Feeding numerous people doesn't have to be expensive. By keeping an eye on the cost and amount of ingredients required to create the dishes you choose, you can select less expensive foods and cut costs.